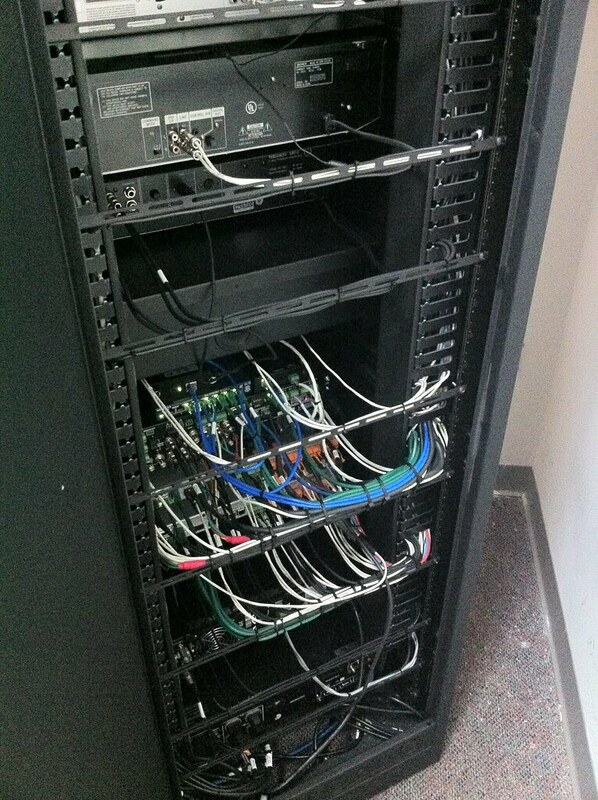 A few shots of the upgraded rack with modified and new equipment, improved cable management, and superior organization, as well as the new touch panels for system control. This is how the committee room at my office should have been set up in the first place. Very happy for Sound Stage to come in and re-do AVI's inferior job. I'm pleased as punch to see this project completed (other than adding a lockable drawer in the empty slot about 1/3 the way down from top. Proper control of the audio/visual system in my office's main committee room has been a LONG time coming! You should've seen the disarray left by the company that originally installed this equipment. Thanks to Sound Stage for the do-over, done right! The original touch panel controller is now in the main meeting room and accessible without require access to my A/V closet. The buttons are in a much more simple arrangement than the previous template. The physical buttons on each side are inoperative. 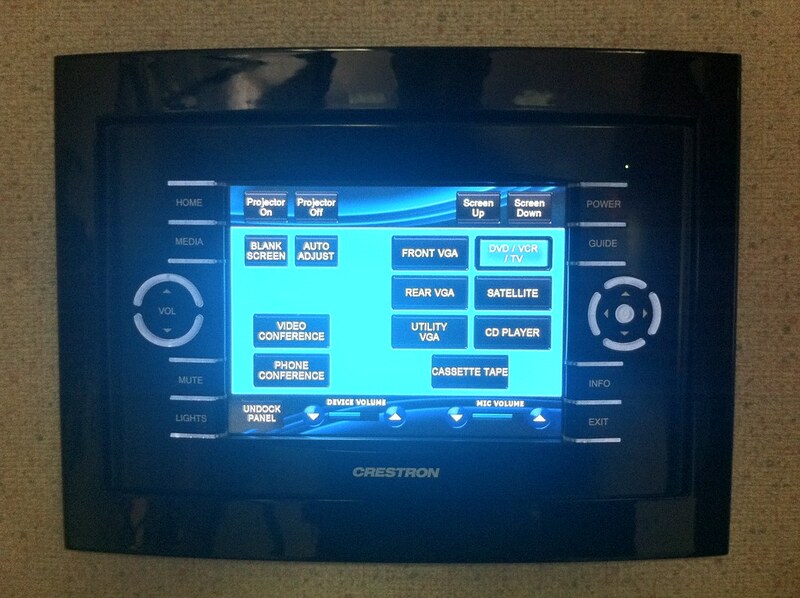 Everything is controlled via the touch panel. I could probably buy a replacement plate to hide the buttons, but I don't think they're going to be a problem to anyone if I just leave it alone. The whole panel can come off the wall dock and be used wirelessly, but I won't encourage that behavior. Most people can get all the functionality they need while leaving it in the wall. 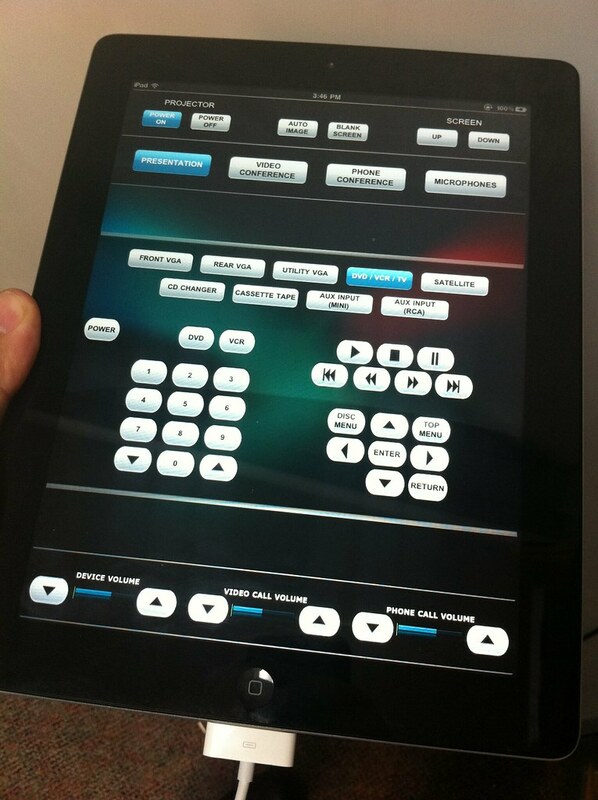 While most people can control the equipment with the small touch panel in the meeting room, I will use the iPad running Crestron's app. For now, the only real difference is that the iPad has independent control of each microphone (the small touch panel has just one volume control that affects all mics, for simplicity), better button layout, and longer battery life. The small touch panel in the committee room will always remain simple in capability, the iPad app could be updated in the future to offer greater control of added equipment.